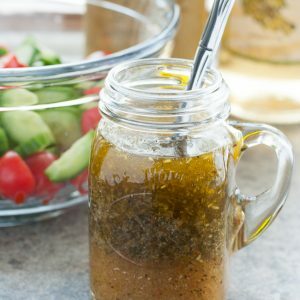 This uber easy homemade Italian dressing is so fast and flavorful, you'll never buy pre-made dressing again! Whisk all ingredients together and allow to sit. Giving the dressing some time to mingle will not only infuse flavor into the oil/vinegar but also soften the dry herbs and seasoning. This dressing will keep in your fridge for about a week so make extra to drizzle over a week's worth of salads! Enjoy! Craving a little kiss of Parmesan in your dressing? Fabulous! Add 1-2 TBSP of finely grated parmesan cheese and blend in a small food processor or blender. You can even add a little dijon vinegar to the mix if you'd like! Feel free to adjust oil-to-vinegar ration to taste. The above 1:1 measurements are my idea of perfection in a vinaigrette and I love how refreshing it is! 1 parts vinegar to 3 parts oil is a bit more conventional if desired. I promise not to pout if you add extra olive oil!